LAS VEGAS, Jan. 28, 2019 /PRNewswire/ -- Caesars Entertainment Corporation (NASDAQ: CZR), the world's most diversified casino-entertainment company today announced plans to open Caesars Republic Scottsdale, its first non-gaming hotel in the United States, as part of its plan to expand its brands and loyalty network through its licensing strategy. High-res image and video can be downloaded here. 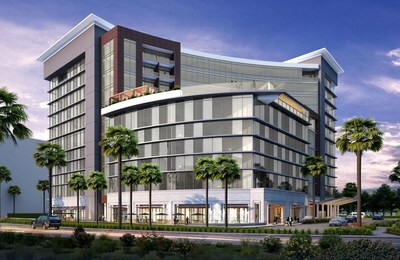 Caesars Republic Scottsdale will be located adjacent to the region's premier luxury retail destination, Scottsdale Fashion Square, and will be a four-star hotel developed by HCW Development and operated by Aimbridge Hospitality. Caesars Entertainment will license its brand, advise on design elements and integrate the industry's leading loyalty network, Total Rewards. Caesars Republic offers a new kind of lifestyle hotel experience; the first brand from Caesars Entertainment designed exclusively for non-gaming hotels. Caesars Republic is a brand with an edge: it inspires the imagination, pushes creative boundaries and collaborates with trendsetters. Project team currently includes BRP Architect firm out of Springfield, MO; Studio 11 Interior Design from Dallas, Texas; Transaction handled by LeDonna Spongberg of CBRE'sPhoenix office. HCW is a nationwide real estate property development, management and hospitality company with offices in Wichita, KS, Branson, MO and Phoenix, AZ. HCW's diverse portfolio spans from full-service hotels and retail to multifamily apartments and condos. HCW has developed over $2 billion in real estate. For more information about HCW please visit www.hcwdevelopment.comor call 417.332.3400.